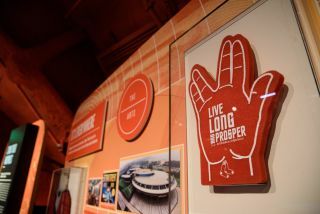 A sign reading "Live Long and Prosper" — a well-known saying from Spock and other members of the Vulcan species — adorns the wall in the exhibit. The legacy of "Star Trek" continues to live long and prosper at Seattle's EMP Museum, where a new exhibit is celebrating the 50th anniversary of the iconic science fiction franchise. This year, the long-running science fiction series celebrates 50 years since Capt. James T. Kirk and the rest of the USS Enterprise crew embarked on a five-year mission to explore the universe. The TV show lasted only three seasons, but its popularity has inspired several more television series, movies and other spin-offs, including games and theater productions. This is the VISOR (Visual Instrument and Sensory Organ Replacement) that Geordi La Forge wore during the television series "Star Trek: The Next Generation" (1987-1994). "More so than spaceships and phasers, the one quality that defines 'Star Trek' is optimism," the statement continued. "Creator Gene Roddenberry imagined a 23rd century in which humanity had eliminated the divisions that characterized his own time. By using alien worlds, interspecies conflicts and sci-fi premises to make statements about war, racism and politics, 'Star Trek' revolutionized the impact popular culture could have on our society." The exhibit includes the iconic captain's chair from the original USS Enterprise, which is on display for the first time in 25 years. The exhibit offers a lot to see for newer generations of "Star Trek" fans, as well. The latest "Star Trek" movie — the third in a series starring a rebooted cast — will open in July. The museum exhibit includes items from that series, including the "Khan" costume that Benedict Cumberbatch wore during the most recent movie ("Star Trek Into Darkness") in 2013. And yes, Ricardo Montalbán fans, his costume from 1982's "Star Trek II: The Wrath of Khan" stands right beside Cumberbatch's version. Here are the famous Star Trek villain's outfits as worn by two actors: Ricardo Montalbán (left) and Benedict Cumberbatch (right). More than 100 artifacts and props are on display, including costumes from the original-series characters Kirk, Spock, Uhura and McCoy, as well as the 6-foot (1.8 meters) long USS Enterprise model from "Star Trek: The Next Generation."